Arcam miniBlink review | What Hi-Fi? Blink. No, that’s not a command, but the suffix Arcam uses for its small range of Bluetooth DACs. First came the rBlink, a £150 unit launched in 2013. But now it has a sibling: the miniBlink. 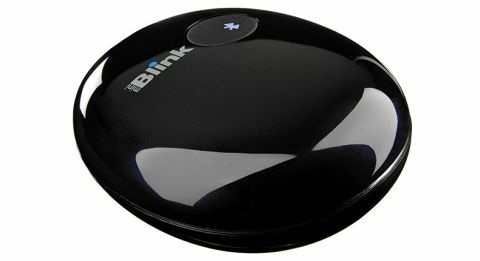 The miniBlink is a small, compact unit shaped like a well-polished pebble. It certainly looks different among a sea of square and rectangular rivals. Physical connections extend to a simple 3.5mm analogue output. This may seem a little mean to those expecting digital outs to feed into an amp or external DAC, but isn’t the end of the world. Even limited to just the supplied 3.5mm-to-RCA phono cable, you can hear that this is a talented device pushing for top honours. Pairing is a piece of cake; there’s a round, recessed button adorned with a Bluetooth icon sat on top of the miniBlink – press and hold and it’s ready to be paired up. The Arcam also supports aptX Bluetooth should your source be compatible. Where some Bluetooth DACs sound zingy and bright, the Arcam sounds buttery smooth and doesn’t sacrifice detail or lose any of its cutting edge. It’s impressive that Arcam have been able to squeeze such a sense of refinement and quality from a device like this. Like many of Arcam’s hi-fi separates, there’s a real sense of rhythm and fluidity to music. You get a real feel for dynamic shifts within music, the leaps from quiet moments to more outlandish sections are explicitly done, and music sounds more exciting for it. Michael Bublé’s version of Cry Me a River combines the Canadian’s smooth, crooning vocals with a dramatic burst of big band and the Arcam delivers in spades. Wind instruments and percussion explode into life and give the track serious dynamic clout. There’s a real sense of drama as the ensemble of instruments reaches the song’s climax. Switch to a more intimate track such as Bruno Mars’s When I Was Your Man and the vocal and piano hang beautifully in front of the listener. There’s a real sense of emotion for you to latch onto.